After months of casually looking at homes online, a potential homebuyer decides it’s time to get serious about buying a home. She begins searching for homes in a specific area, looking for properties that have a specific number of bedrooms and bathrooms and that fit into her price range. Spotting a couple of interesting possibilities, she saves those homes with the intention of coming back to them later, maybe visiting them if they’re open this weekend. Later that same day, a real estate agent with knowledge of the consumer’s search area gets an alert on her mobile device about the woman’s search activity and is advised that it’s time to reach out to this potential buyer. Before the consumer even thinks to call an agent about getting into those houses, the agent is contacting the potential buyer, armed with a sneak-peek window into the early stages of the consumer’s home-search process. That’s the power of Zap. 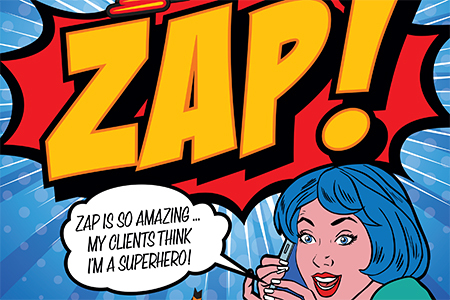 It’s not as dramatic as Clark Kent emerging from a phone booth as Superman, but Zap does give mild-mannered real estate agents and brokers real superpowers when it comes to identifying potential customers and accurately anticipating their service needs. There are many real estate agent-technology platforms out there, but none operates quite like Zap. According to Lanny Baker, chief executive officer of ZipRealty, Zap is a fully integrated system that gives brokers and agents the ability to understand, anticipate and serve their clients’ needs. “The power of Zap is that it provides the agent the ability to know who needs help, what help they need, and how to deliver that help even before they reach out for it,” Baker says. The Realogy-Zap story began in early 2012. During a meeting of Realogy’s franchise brand senior leadership, a strategic recommendation was made to improve the company’s value proposition for its affiliated brokers by offering a turnkey technology solution. Enter ZipRealty and its new Zap platform. A system 15 years in the making, it offered everything that Perriello and his team were looking for. After doing their due diligence, it was determined that buying the company and its technology was the best way to go. In August 2014, Realogy acquired ZipRealty for $167 million, including its owned brokerage offices that were subsequently integrated into NRT, Realogy’s owned brokerage segment. A big part of what made the Zap platform attractive to Realogy is that it was built and refined by a real estate brokerage company. The next decision Realogy made was to make Zap an integral part of its brands’ value propositions for their franchisees by providing it free of charge. In addition to being created by a company with a firsthand understanding of how the real estate brokerage business works, the Zap platform stands out because of the way in which it is completely interconnected. With Zap, each participating brokerage receives a custom-branded website and mobile app that displays complete, accurate and up-to-date MLS listings surrounded by all kinds of relevant data, such as school information, lot lines, neighborhood profiles, price trends and transaction histories. The Zap platform allows consumers to create their own searches, dig deep into local market data, and save and share the results they find. Meanwhile, Zap sends automated notifications to agents, keeping them up-to-date on each individual consumer’s research activity. Configurable agent websites and agent-specific mobile app experiences provide marketing support that promotes the agent’s local expertise and service track record with other consumers. Zap-powered agents gain tremendous insight about consumers’ behavior and interests, while the agent’s daily activities—touring homes, listing homes, showing properties, closing deals—are simultaneously cataloged and communicated to consumers through the same interconnected Zap system.